There are lots of reasons that you are going to love this dish! I love it because it’s a healthy, meatless, dish that can stand on its own, but at the same time, it can also be a great side dish for your favorite protein. What I love most about this dish is that it is SPICY! I love spicy food, but I didn’t want the dish to be all about the heat. What I wanted to do was create lots of flavor to compliment that heat! So, to do that, I tucked little bits of heat into each component, layering flavors and spice, creating an end result that won’t leave you breathing fire or reaching for the nearest glass of milk! 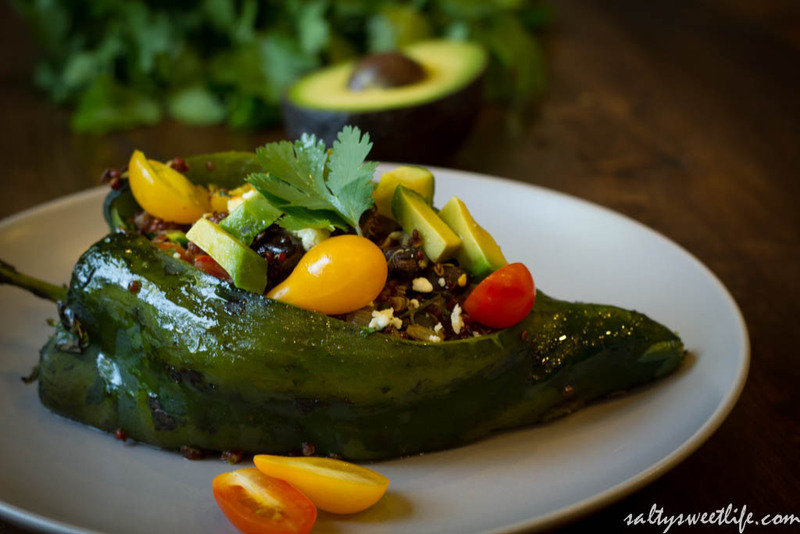 Typically, when you see a poblano pepper, it’s in the form of a chile relleno that you find at your favorite Mexican restaurant. The chile is stuffed with cheese, dipped in batter and deep fried. Now, I don’t have anything against foods that are filled with cheese and deep fried, but realistically, that’s just not going to happen with any frequency around here. 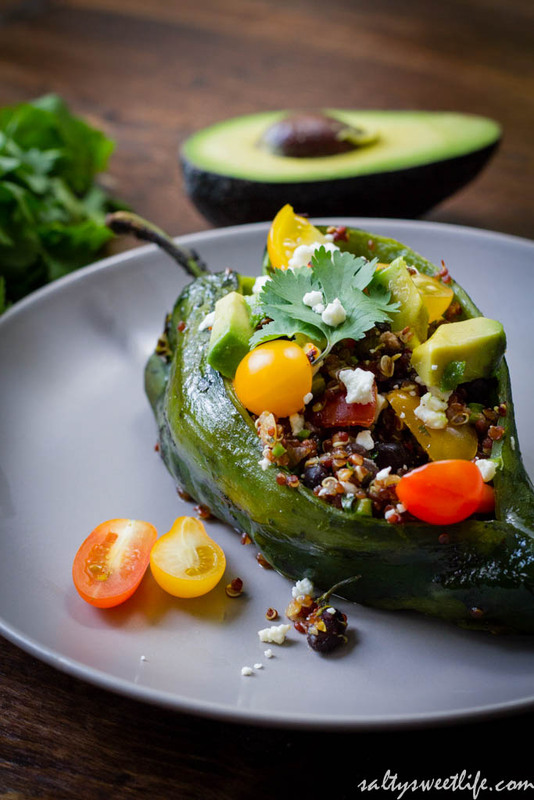 So, I wanted to “healthy up” the chile relleno–stuffing it with quinoa, black beans and tomatoes, and topping it with a reasonable sprinkling of cheese. It’s a great dish–full of protein and whole grains, it is so very filling and you won’t even miss the meat! If you aren’t a fan of spicy food, you can still make this dish by simply omitting or decreasing the amounts of some of the more fiery ingredients. Poblano peppers are easily found at the regular grocery store, but I’ve found that they are often improperly labeled as “pasilla peppers”. They are dark green in color and shaped like an arrowhead. They are typically a milder pepper, but the ones I made for this recipe were actually quite spicy! I love spicy surprises! 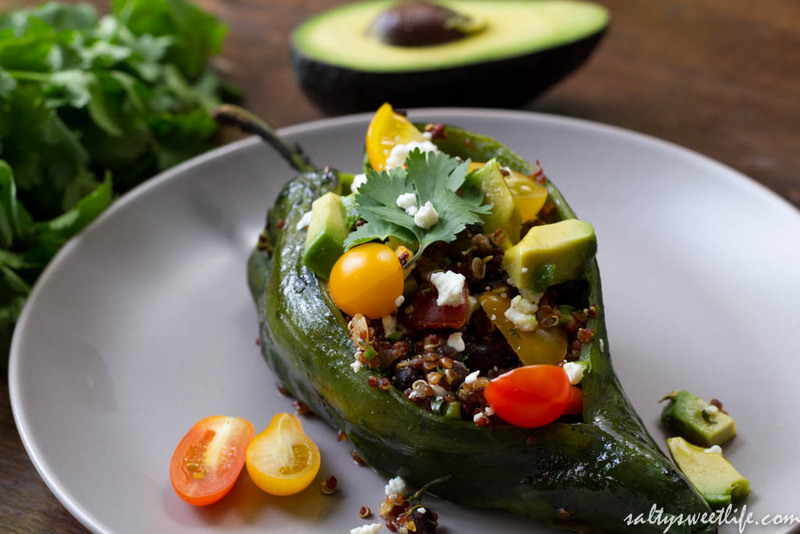 Purchase the largest peppers you can find since that will make stuffing then that much easier. This dish is moderately fussy, but it’s all for a good cause! 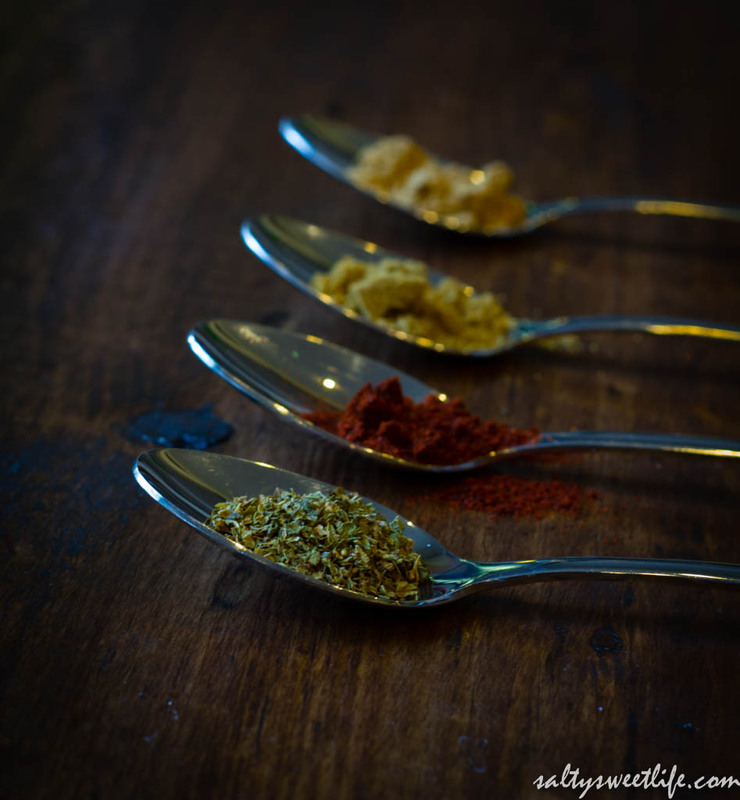 In order to make it extra flavorful, each component is seasoned to perfection before it’s melded together as a stuffing. The peppers are fire roasted first, which deepens their flavor and also eliminates any bitterness that you might encounter in the skin. The beans are seasoned with spices that are fairly common to Southwestern dishes: Mexican oregano, chipotle chile, cumin and coriander; then all of the components are brought together with a generous squeeze of lime juice and lime zest and lots of bright, flavorful cilantro! 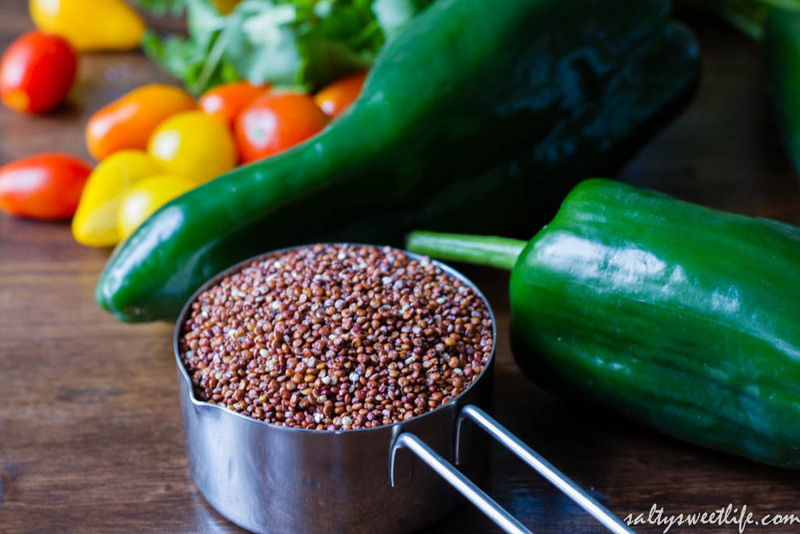 Place the quinoa in a fine mesh sieve and rinse thoroughly with cold water. This is an important step as it rinses off the bitter saponins found naturally in the quinoa. Combine the rinsed quinoa with 1 cup of chicken or vegetable stock and 1/4 teaspoon of kosher salt in a small saucepan. Bring the mixture to a boil, then lower the heat to a simmer, cover and cook until all of the liquid is absorbed (about 15 minutes). Using tongs, roast each pepper over the hottest flame on the stove. Turn the pepper until the surface of the skin is evenly charred and bubbly. Once each pepper is blackened, place it into a paper bag and close the bag. 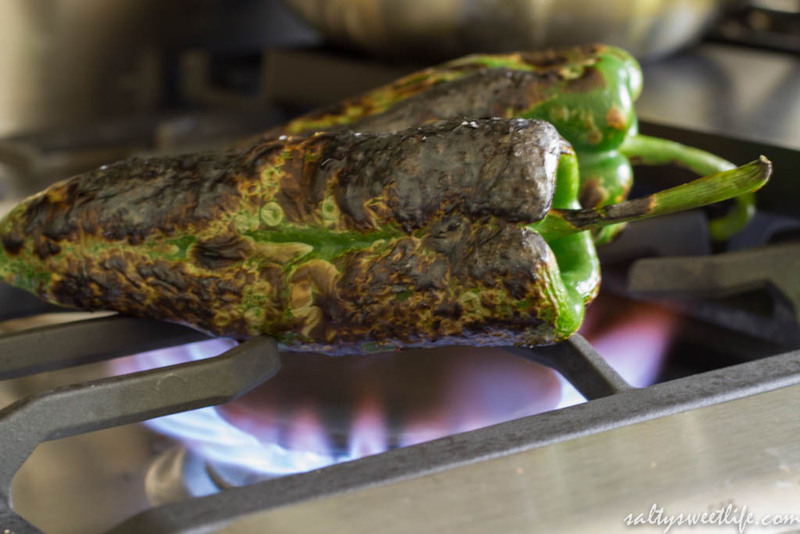 If you don’t have a gas stove, you can place the peppers under the broiler on the highest setting. Use the tongs to turn the peppers until they are evenly roasted. Allow the peppers to cool in the paper bag. Once the peppers are cool enough to handle, use a sharp knife to scrape off the burned skin. The skin should come off easily. With the sharp point of the knife, gently make an incision in the pepper to make a pocket. Remove the seeds and set the peppers aside. In a sauté pan, heat one tablespoon of olive oil over medium heat. Add the onions and garlic and sauté for 2 minutes, until the onions become translucent. Add the oregano, cumin, coriander and chile powder to the onions and sauté for 1 minute to bloom the spices. 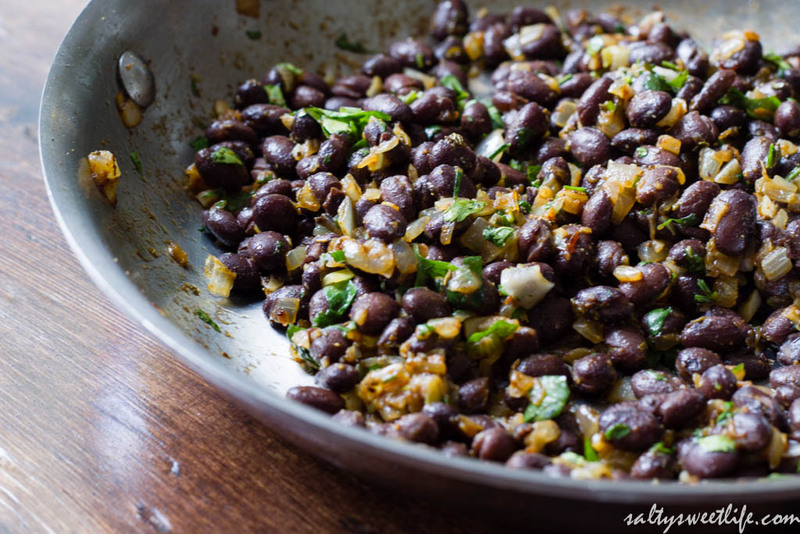 Add the black beans, 1/4 teaspoon salt and about 1 tablespoon of chopped cilantro and stir. Remove from the heat and set aside. 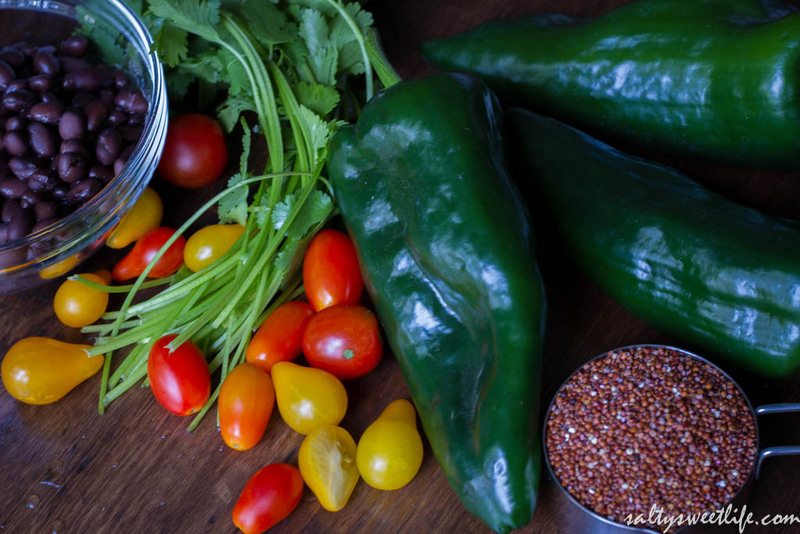 In a medium sized bowl, combine the cooked quinoa, seasoned black beans, tomatoes, serrano pepper, lime zest, lime juice, the remainder of the cilantro and 1/4 teaspoon salt. Spray a baking sheet with cooking spray or coat with a little olive oil. 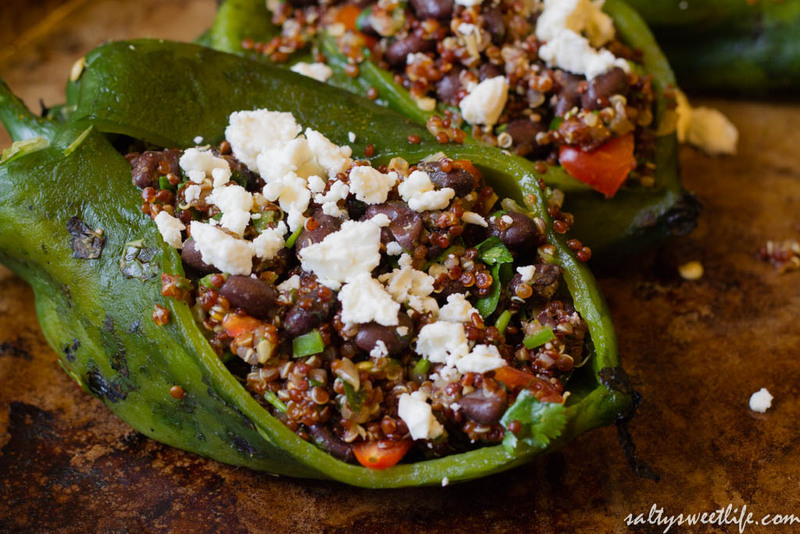 Stuff the peppers with the quinoa mixture and place each one on the baking sheet. Sprinkle each pepper with the cheese. Cover the peppers with foil and bake for 15 minutes. Remove the foil and cook for another 5 minutes. If you want a milder dish, either decrease or omit the serrano pepper and the chipotle chile powder. To serve, I topped the peppers with chopped avocado and cilantro and a bit of our favorite salsa! Your pictures are amazing!! This looks so good!!! Thank you Christina! That means so much coming from you! You take such perfect photos! I hadn’t had a chance to tell you how much I enjoyed those biscuits you made this week! Thank you! And you have been cooking up a storm this week! Looks terrific. When they are in season I always get a ton of poblano sat the farmers market. I usually do rellenoa or dry them. Want to try this sooner so may have to buy in the store. Hope u don’t think it’s blasphemy but I may meat it up. Chorizo maybe? I don’t think it’s blasphemy at all! I think chorizo sounds like a great addition! Let me know how it turns out! Oh my goodness, this looks incredible!! You are so sweet to say that, Rimi! Thank you so much! You know how much I love your photos–you do such an amazing job! Next month I’m going to a food styling/photography workshop with White on Rice Couple. I can’t wait to learn from them!